The year 2010 had its ups and downs. As we close the book on the previous 12 months and look to the year ahead, I continue to be thankful for everything and everyone in this wonderful life God has given me. I am SO glad to see 2010 behind us! 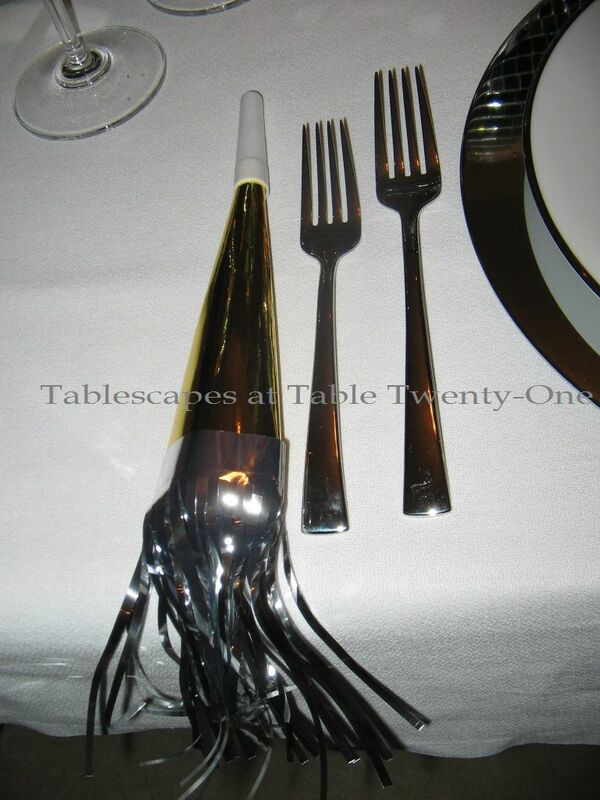 It was with great pleasure that I set this last table to help ring in the new year. Once again here I’m showing the photos in both “lights on” and “dimmed light” mode so you get the idea of the effect. 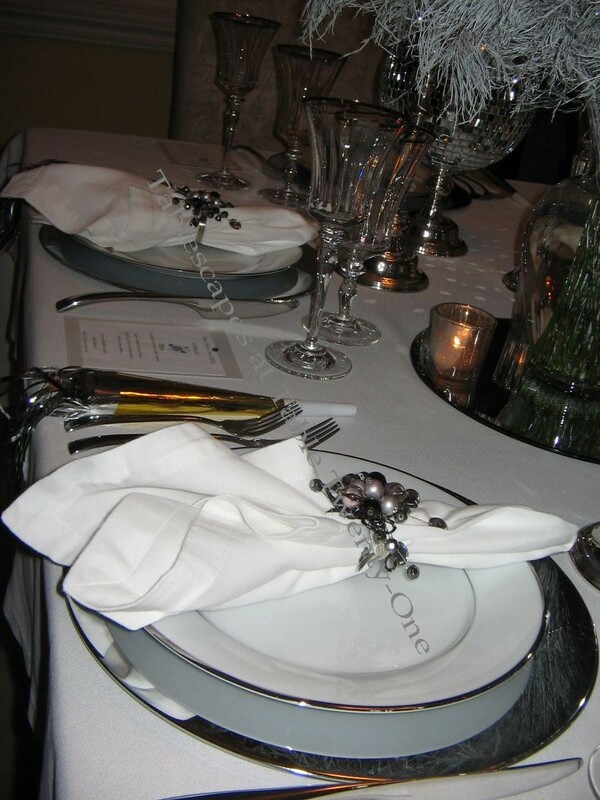 On a white cotton table linen, a shiny silver charger topped with Noritake’s “Spectrum” platinum-rimmed china dinner plate. 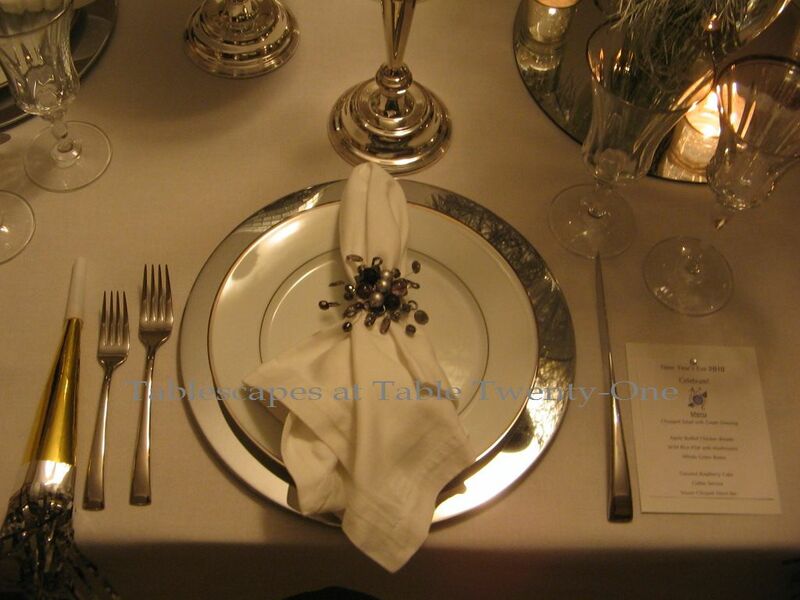 The flatware is “Bellaserra” stainless by J.A. Henckels, and the stemware is Mikasa’s Jamestown Platinum. 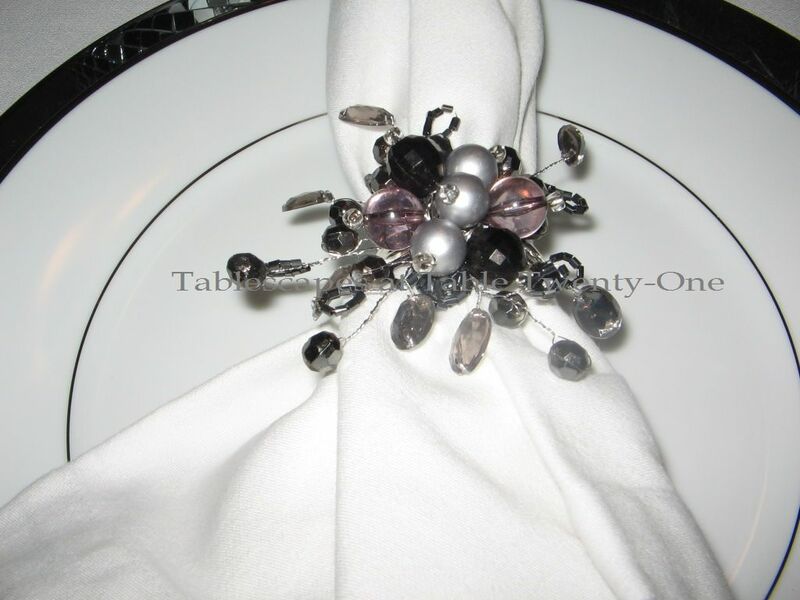 Simple white cotton napkins are made special with the addition of these fabulous jeweled napkin rings in hues of silver, platinum, pewter and slate. 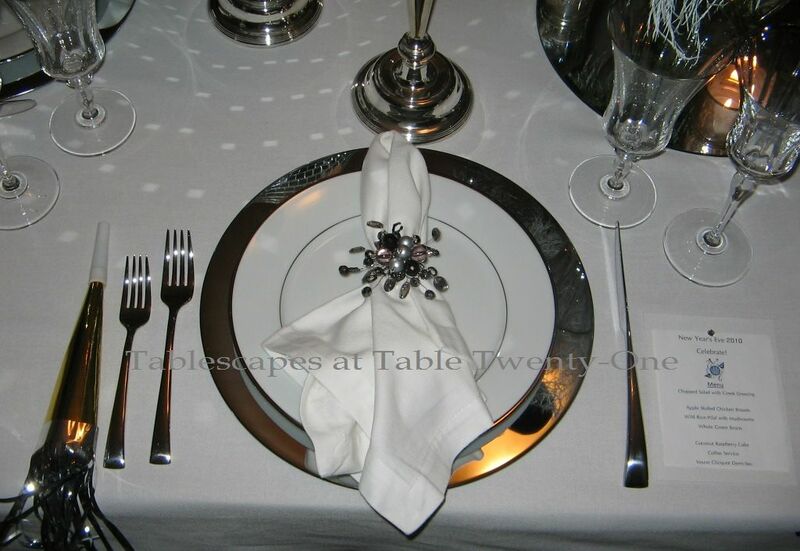 To the right of each place setting, a menu adorned with a tiny rhinestone for a more glamorous effect. 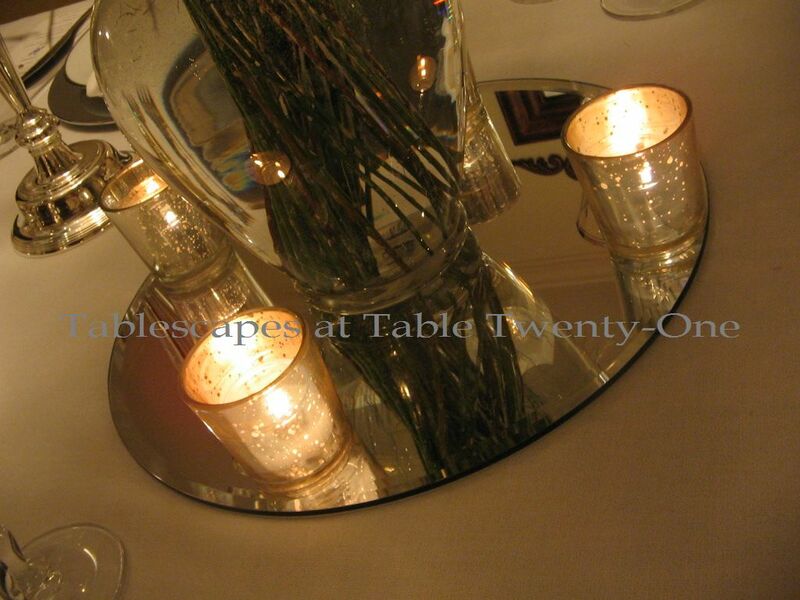 The floral piece sat atop a 13″ round mirror to double back the sparkle and shine of the tree fern and the mercury glass votives. I’m not always a fan of mirrors unless they’re oversized like these or an unusual shape or design. 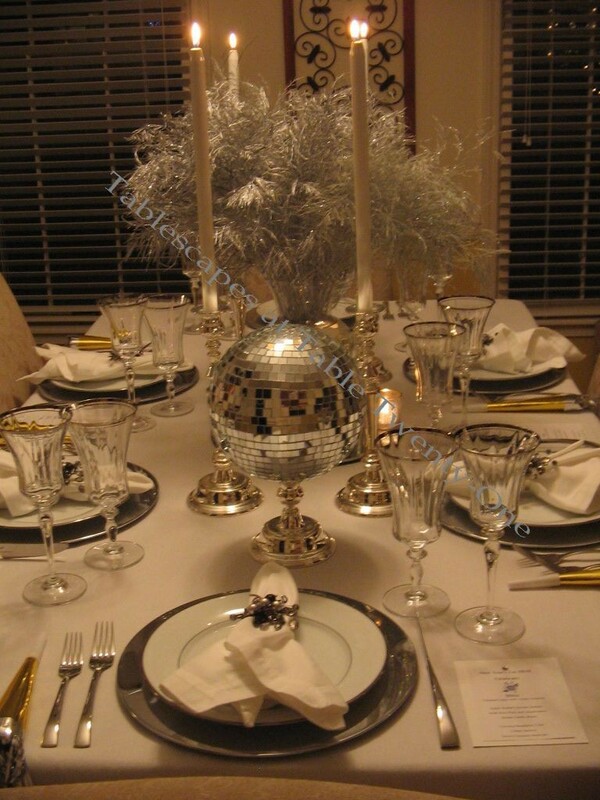 These 20mm ornaments were the perfect simulation of and substitute for the traditional mirror ball drop! I simply plopped them atop 5″H Revere candlesticks. 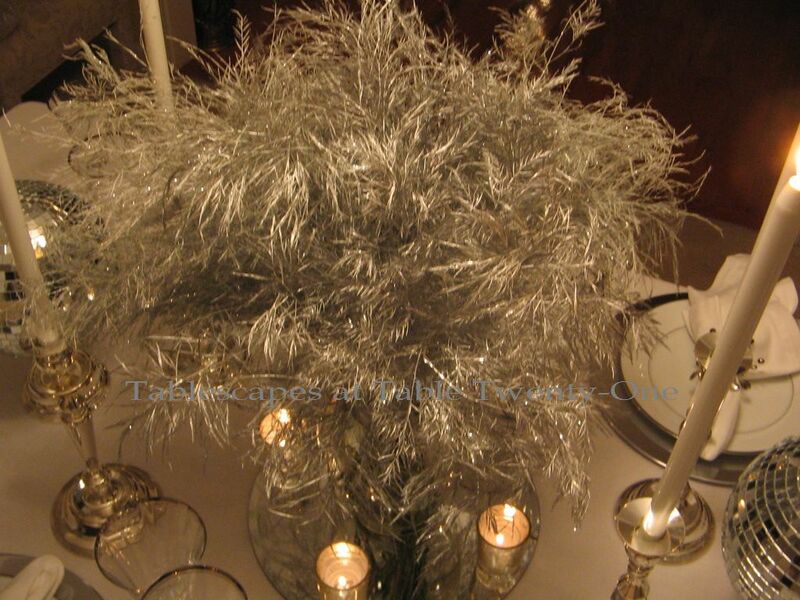 (I considered hanging them from the ceiling, but they’re a bit heavy and the thought of them dropping onto the table and shattering glass everywhere – like in THIS Thanksgiving disaster – during dinner terrified me!) 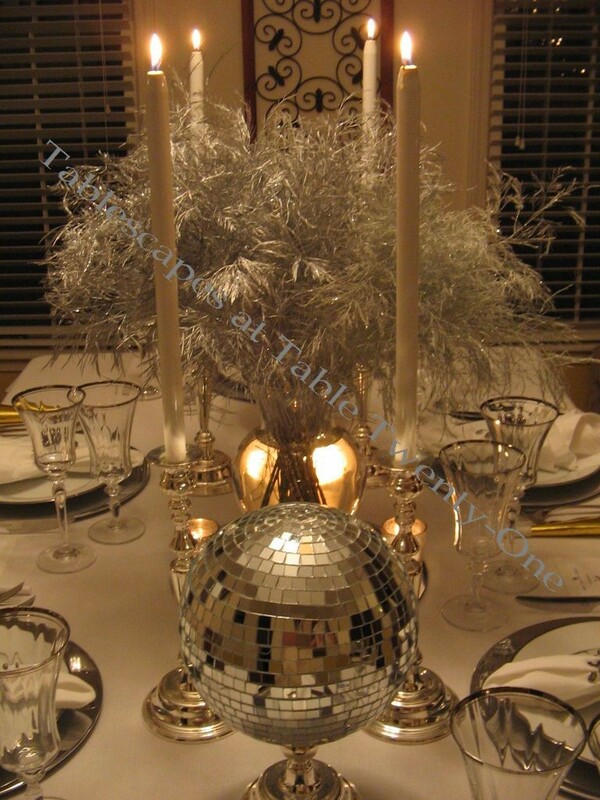 To see these mirror balls used in another New Year’s Eve tablescape, click HERE. I hope you and yours enjoyed a wildly exuberant and joyous (yet safe!) New Year!!! 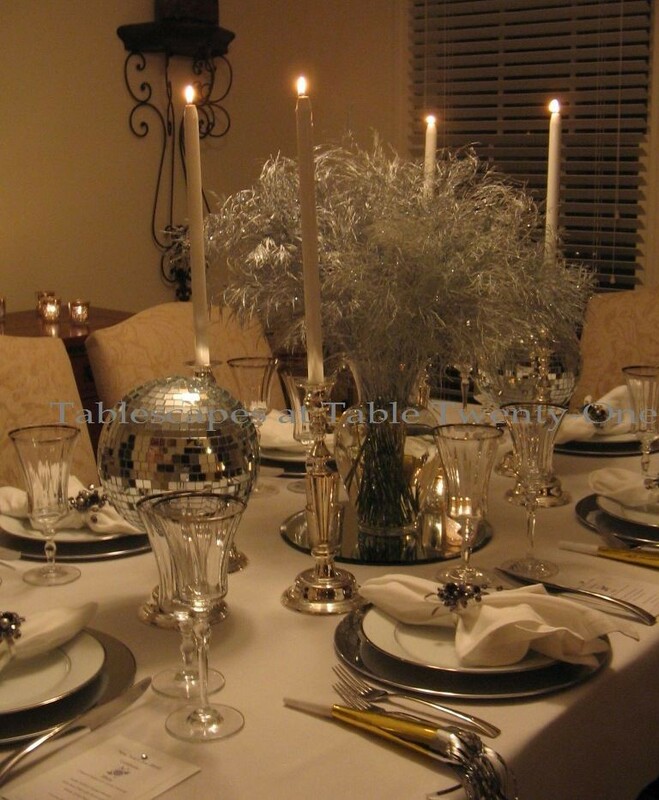 To kick off the new year, I am pleased to once again join Susan and my fellow tablescapers for Tablescape Thursday. After viewing my photos on the “Winter” tab, you might want to mosey on over to Susan’s place for a look-see at their creative designs! Happy New Year, one and all! Ooooh…shiny! Where’s the “like” button? 🙂 Happy New Year my friend! OOOh Happy New Year.. I’m in LOVE!!! 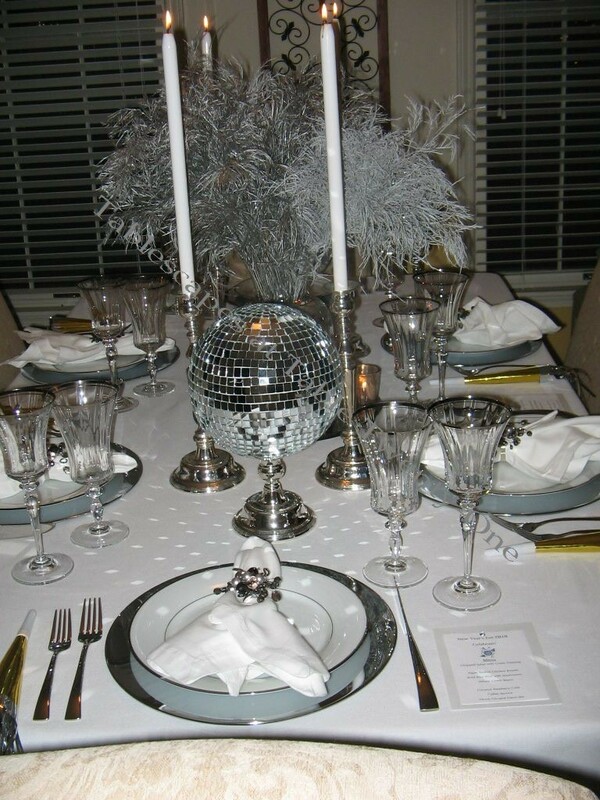 the knives, the glimmer balls, the center piece, the candles, the candle sticks.. the glasses, the plates, the chargers.. Alycia – this is absolutely the way I’d love to ring in the New Year. Absolutely fabulous!! ooh and the old widow.. now you are talking!!! or I’d be sipping.. Perfection. Stunning, elegant, behold the WOW factor! 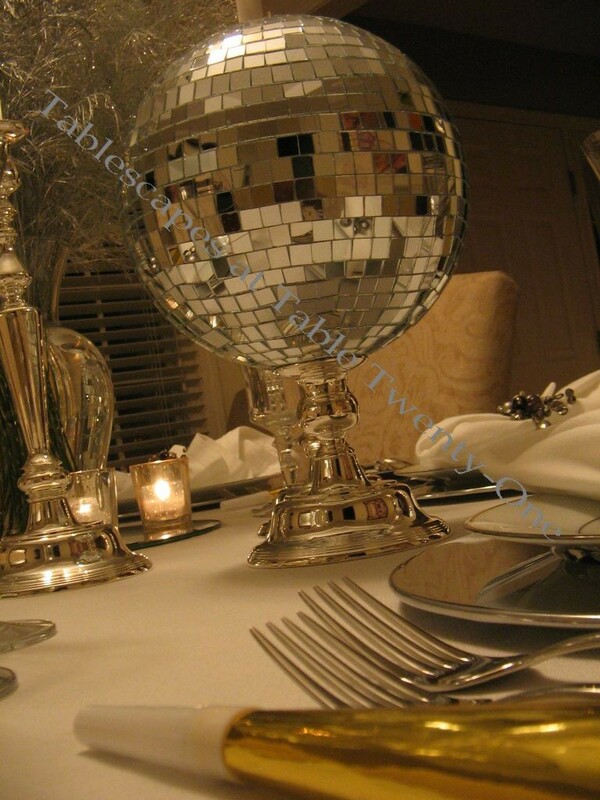 LOVE the mirrored balls – those were my favorite! 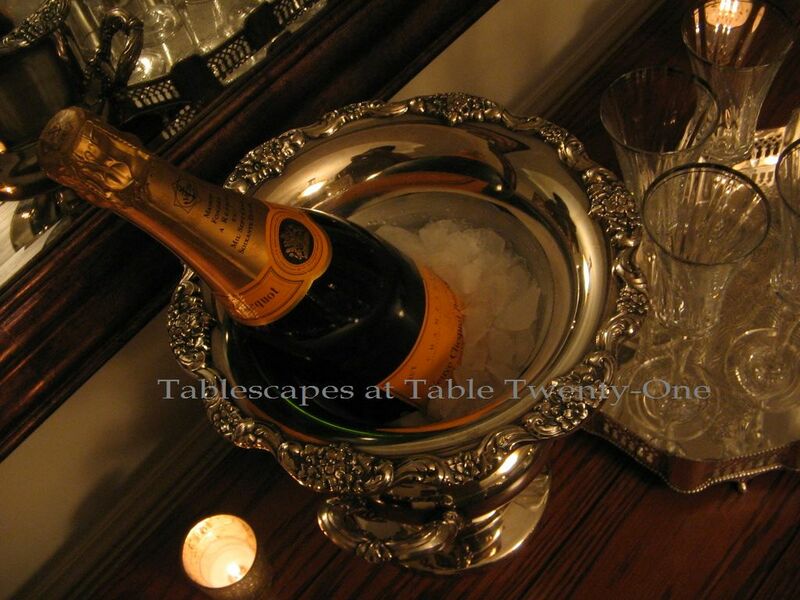 So cool how they sparkled on the table! 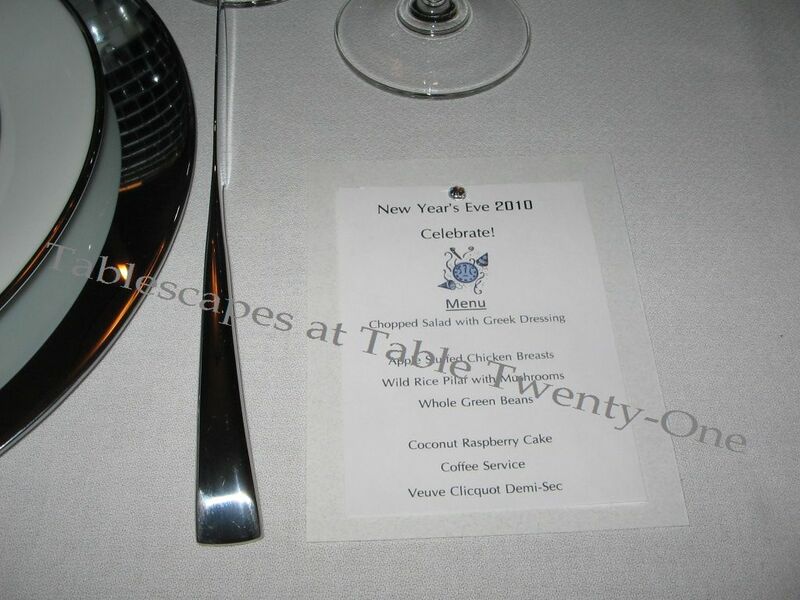 GREAT idea….SO creative! I did get up and start dancing to the Bee gees…I think it was stayin alive!